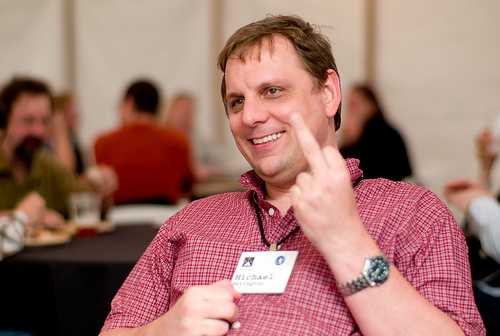 Today the guy who runs Fusion Garage, and who was Michael Arrington’s partner on the CrunchPad — the guy Arrington claims screwed him — is going to have a press conference and tell his side of the story. Can’t imagine which lame hacks will actually attend this sideshow, but I hope someone does so we can at least hear what the guy has to say and the 14 people who were actually planning to purchase a CrunchPad can finally get some clarification. Better yet, now the freetards are weighing in, because Arrington promised, early on, that he would open source the design, and now they want him to keep his word and just give the design away so that other amateurs can experience the joy of struggling for months to build a product that doesn’t actually work. Good luck with that, freetards. We wish you well.